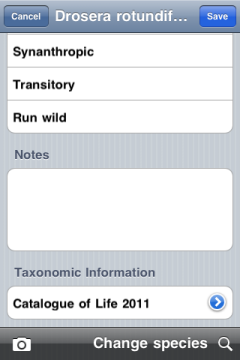 In the beginning, your GPS-data are determined in the individual find dialogue. 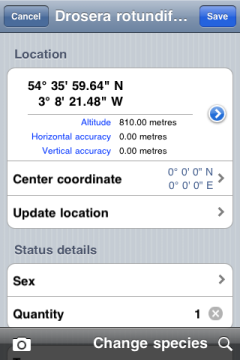 Learn more about GPS details here. Subsequently, you can add status details or attach information on the find. 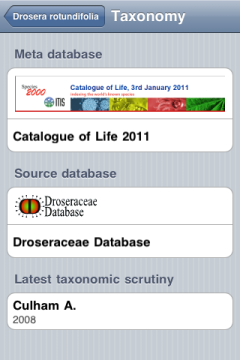 If your are a user of the Database Catalogue of Life you will find a menu entry at the bottom of the dialogue Taxonomic information that leads you to the latest taxonomic scrutiny and the data base that species stems from. 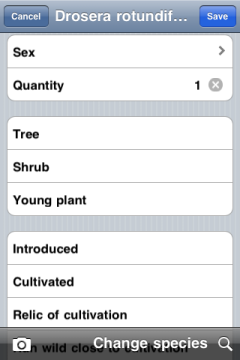 With Save your information is transferred to the database and you get back to the search page. Quantity Enter the quantity of found species. Notizen Enter your notes here.